1. 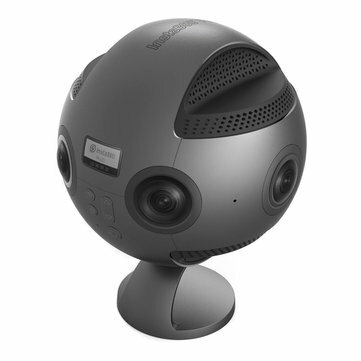 The Pro Insta360 8k camera has a compact, spherical custom-milled aluminum alloy chassis and is surrounded by six 200 degree lenses with a host of features. A basic and easy-to-grip removable contour make a companion on the multi-purpose tray. 2. Optical flow image stitching: precise, dynamic and transparent. 3. Use 3 to 6 lenses depending on your scene. 4. With cube mapping and H.265 compression, creators can reduce bandwidth requirements by 60% for smooth, efficient live streaming. 5. Stay steady with advanced real-time image stabilization. 6. Redefined 360 degree VR into 8K. The definition can reach unprecedented 7680 * 7680 in post-stitching. 7. Support up to 4K 360 degree 3D live streaming On any 360-supporting platform and Insta360 server via Ethernet/WiFi/4G. The Cube Map Prohection + H.265 live streaming mode can save up to 60% internet flow. 8. Slow motion can reach 4K/100fps high speed. 9. Optical flow stitching technology ensure all details are close to nature. 10. Optimized stabilization function make moving shooting stabler. 11. With 4pcs built-in mic and support external mic for crystal clear sound effect. 12. Powered by 5000mAh replaceable rechargeable battery, support USB on-board rechargeable. 14. Made of aluminum alloy and PC, kept in a compact carrying case.